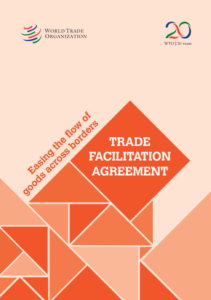 The World Trade Organization published this snapshot of the Trade Facilitation Agreement (TFA). The briefing explains the challenges that border procedures currently pose to both governments and businesses and how the TFA will help to address them. The Trade Facilitation Agreement is the first multilateral trade agreement to be concluded since the WTO was established 20 years ago. Once it enters into force, the Agreement is expected to reduce total trade costs by more than 14 per cent for low-income countries and more than 13 per cent for upper middle-income countries by streamlining the flow of trade across borders. Under current border procedures, the average transaction can involve numerous steps. The Trade Facilitation Agreement (TFA) sets forth a series of measures for expeditiously moving goods across borders inspired by the best practices from around the world. The Agreement is ground-breaking in that, for the first time in WTO history, the commitments of developing and least-developed countries are linked to their capacity to implement the TFA. In addition, the Agreement states that assistance and support should be provided to help countries achieve that capacity. An amendment protocol for the Trade Facilitation Agreement was adopted by the General Council in November 2014 to bring the TFA into the WTO’s legal framework. The Agreement will enter into force when two-thirds of WTO members ratify the TFA and deposit their instruments of acceptance with the WTO Secretariat. Hong Kong, China, became the first member to do so in December 2014. Developing and least-developed countries may require help to implement the provisions of the TFA. WTO members have therefore established the Trade Facilitation Agreement Facility as a means to assist developing and least-developed countries in securing assistance and support. Under the Facility, the WTO Secretariat will expand its existing technical assistance programmes, provide information on the assistance programmes made available by donors and other international organizations, and assist with matchmaking of donors and recipients. It will offer two types of grants in situations where no other source of assistance is available. Developing and least-developed countries evaluate their ability to implement the TFA by selecting one of three categories for each of the Agreement’s provisions. Category A denotes measures that the member will implement by the time the Agreement enters into force (or in the case of least-developed countries within one year after entry into force). Category B specifies provisions that the member will implement after a transitional period following the entry into force of the Agreement. Category C indicates provisions that require assistance and support for capacity building to allow the member to implement them after a transitional period following the Agreement’s entry into force. As of 9 March 2015, 54 members had notified the WTO of their Category A commitments. In notifying the WTO of their category A, B and C commitments, developing and least-developed countries are requested to provide timelines for implementation as well as information about any capacities which need to be strengthened.